You can cross every t and dot every i, and birth is still an unpredictable and wild adventure. It smashes expectations and demands surrender. In this way, the best and deepest parts of a woman's heart are called upon to see her through, and in that process a mother is born. Sarah -- an intuitive and insanely informed birth doula -- and her husband AJ planned with wisdom and intentionality every last detail of their beautiful home birth. The space they created was equipped with every necessary practicality, and their hearts and minds were in the game. Sarah labored long and gently at home for a full day or so before she called me in with the camera. Along with their doula, Megan of Over The Moon and their midwife Yolanda of Birthsong Midwifery, they had an incredible team. Though her labor was slow-going, all was going smoothly. Until it wasn't. Suddenly, Sarah lost her vision and became disoriented. Under Yolanda's calm command, we all hustled into action and got her to the hospital -- where an advance call had them expecting her -- within 15 minutes. Then frightening words were being used, like "pre-eclampsia" and "seizure" and "hypertension," as a compassionate and skilled set of health professionals set to work bringing her body and mind back to equilibrium. It was in many ways their worst nightmare, yet the love and support with which Sarah and AJ were surrounded in the process was unwavering. She was in good hands. It took about half a day before Sarah would be out of the woods, and she labored mightily, with a perseverance and determination i've rarely seen, for another day and a half after her health scare. She labored with monitors and medications and many other elements she never planned on. But each one was chosen deliberately and with full informed consent. Through all these things, she didn't lose her power. But a uterus, being a muscle, can get exhausted and refuse to march on, just like the legs of any distance runner that's been pushed to the max. Sarah's lack of sleep over the previous days, the baby's stubborn asynclitic position (and resulting lack of progression), that weary uterus, and finally the baby's increase in heart decelerations eventually lead to the need for a hard decision to be made. 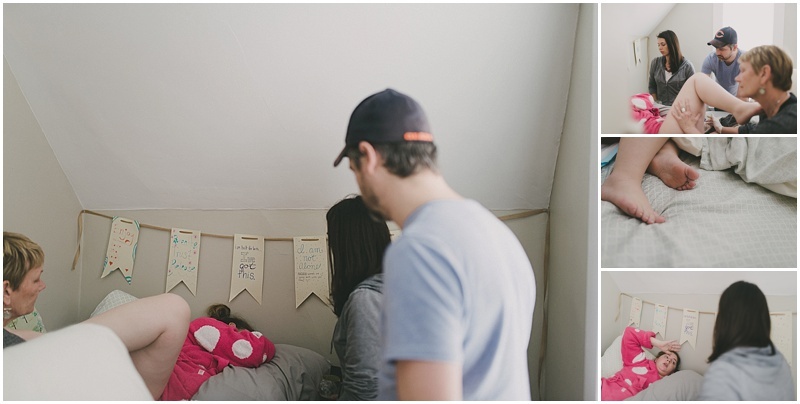 Sarah and AJ huddled together while their birth team gave them space, and in the space of loving trust between them, they decided to elect for a surgical birth. Things moved very quickly then. It wasn't long at all before Sarah was whisked away to the OR, AJ following in his scrubs and holding my pre-programmed camera. And very shortly after that, their beautiful son was brought up and out of Sarah's body and almost immediately to her chest. And what a boy! Hunky and healthy, he stole their hearts immediately, the joy of him overshadowing the travail of getting to him. 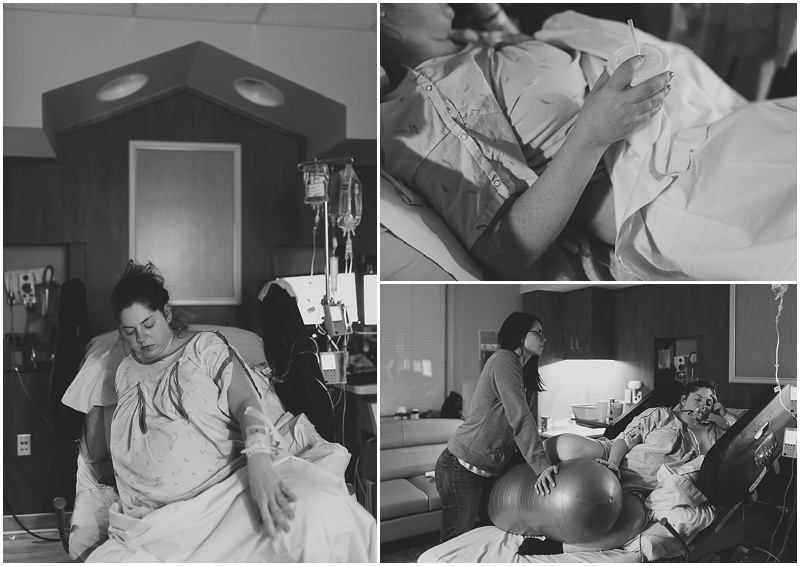 Here, in photos, is the story of William's birth. Please note, I came and went several times, so there are four phases of photos here. Note: because i know this will come up, it is still my firm conviction that home birth is a safe and wonderful choice and that home birth midwives are (more often than not) skilled, wise, and responsible practitioners. this birth story doesn't alter that conviction (or the research that backs that conviction up) in the slightest. yet the truth is that women also need hospitals and OBs, complete with all the tools that they have in their arsenal when birth moves from being a normal physiological event to being a medical emergency. 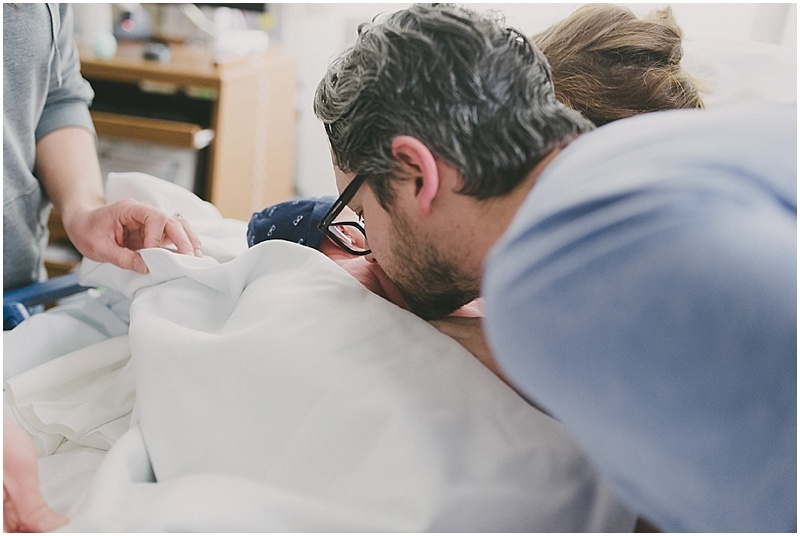 gratefully, that is relatively rare, but when medical help is needed, it is invaluable to have a hospital that is willing to step in and compassionately resolve a birth-related crisis. what we need is not 100% home births in the world nor 100% hospital births; what we need is to have OBs and Midwives who see and value the contributions that the other brings to the table, who can then respectfully collaborate to meet the varying and diverse needs of women in labor and delivery, without shaming or competing. during Sarah's birth, this happened! and when it works, it is really beautiful to witness. i was so proud of both her midwife and the doctors and nurses at Spectrum for their respectful collaboration that centered on the needs of Sarah.